Can wind power be scaled up to 24 TW by 2050? Davidsson, S., et al. 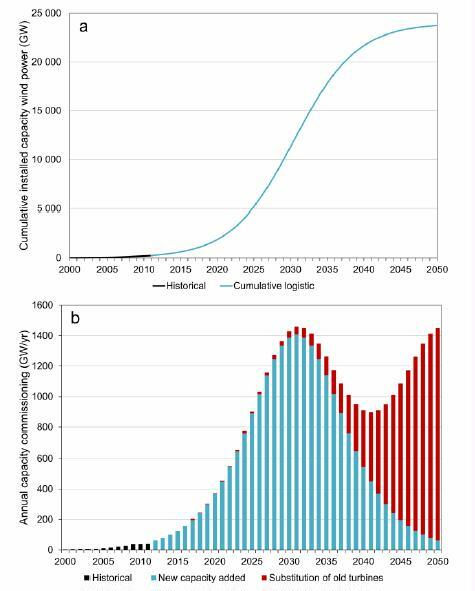 (2014) Growth curves and sustained commissioning modelling of renewable energy: Investigating resource constraints for wind energy. Energy Policy. A few recent peer reviewed studies stand out by proposing future energy systems almost completely based on energy from the wind and the sun, claimed to be achievable as soon as the year 2050, or even more rapidly by 2030 (García- Olivares et al., 2012; Jacobson and Delucchi, 2009; Kleijn and van der Voet, 2010). Substituting the entire current energy system based on fossil fuels with renewable energy technologies involves up-scaling a disparate set of small scale industries, and the time-frame to do this within only a couple of decades, can appear optimistic. The implications of the fast growth of the renewable energy technologies needed to do this are often not adequately addressed in the studies proposing future energy systems based on renewable energy. The question of how these energy systems are then to be sustained over a longer time scale are usually not considered. Laxson et al. 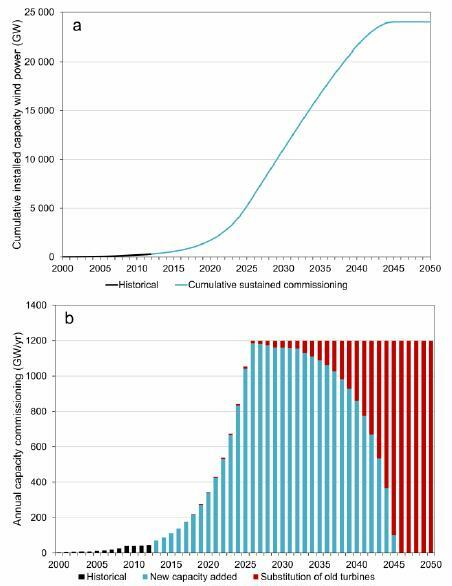 (2006) describes a sustained manufacturing model, where installed capacity of wind energy grows to reach 1 %, 20% and 30% of U.S. electricity demand by 2020 or 2030. After 25 years the capacity installed 25 years earlier are replaced (repowered). The need to replace the capacity after the end of the service life of the wind turbines affects the desired manufacturing capacity of the wind industry. If the installed capacity of wind is to be sustained over a longer time frame, an industry capable of replacing the capacity taken out of use must exist. If the growth trajectory is too slow to reach a manufacturing capacity large enough to replace the old turbines in the future, the actual wind capacity in use can in fact see a drop after the initial goal is reached. On the other hand, if the manufacturing capacity is expanded too fast, the demand for new turbines will drop and leave manufacturing capacity idle. Figure 1. 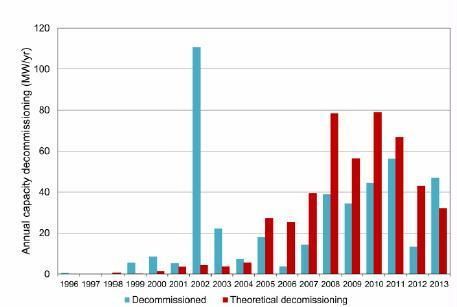 Historically decommissioned wind capacity in Denmark as well as capacity that should theoretically have been decommissioned when taking account for an estimated service life of 20 years. Data from Energistyrelsen (2014). Reaching 24 TW by 2050 alone is modeled using a logistic function. Figure 3a describes a logistic growth curve fitted to the historic data and constrained at 24 TW wind capacity. This appears to be a more realistic growth pattern than exponential growth, but what is not always considered is that the annual additions needed will not only be installing new turbines, but also replacing old turbines at the end of their service life. Assuming a 20 year service life for a wind turbine, the annual requirements of replacing old turbines can be modeled with a second logistic curve with a 20 year time lag. Figure 3b shows the annual commissioned capacity needed both for the net growth as well as replacing old capacity taken out of use. 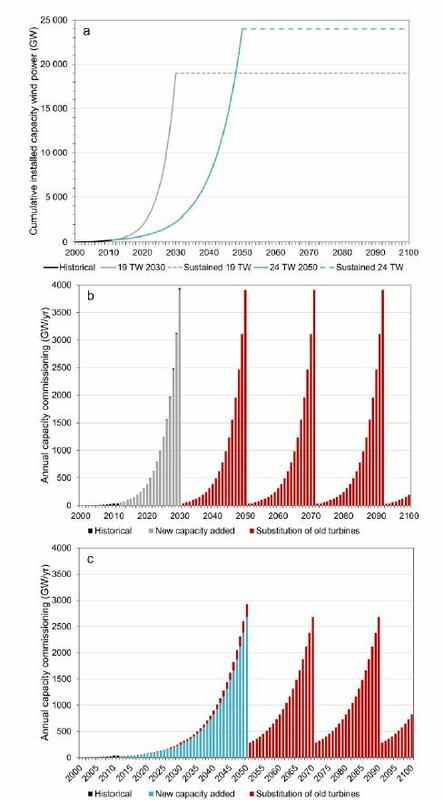 Figure 4. a) A sustained commissioning growth pattern reaching 24 TW of installed capacity wind energy by 2050, where cumulative installed capacity grows exponentially with 26 % annually until reaching an annual installation rate needed to sustain this installed capacity. b) The associated annual commissioning of wind energy required to reach the same level of capacity. Bartlett, A.A., 2006. A Depletion Protocol for Non-Renewable Natural Resources: Australia as an Example. Natural Resources Research 15, 151–164. Dale, M., Benson, S.M., 2013. Energy Balance of the Global Photovoltaic (PV) Industry – Is the PV Industry a Net Electricity Producer? Environ. Sci. Technol. 47, 3482–3489. Elshkaki, A., et al., 2013. Dynamic analysis of the global metals flows and stocks in electricity generation technologies. Journal of Cleaner Production, 59, 260-273. Graedel, T. E., et al., 2011. Recycling rates of metals: A status report. Journal of Industrial Ecology. 15(3), 355-366. Larsson, S., et a;., 2014. Reviewing electricity production cost assessments. Renewable and Sustainable Energy Reviews 30, 170–183. Lenzen, M.,2010. Current State of Development of Electricity-Generating Technologies: A Literature Review. Energies 3, 462–591. Lund, H., 2007. Renewable energy strategies for sustainable development. Energy 32, 912–919. Meadows, D.H., Meadows, D.L., Randers, J., Behrens III, W.W., 1972. The Limits to Growth. Earth Island Limited, London. Trainer, T., 2013. 100% Renewable supply? Comments on the reply by Jacobson and Delucchi to the critique by Trainer. Energy Policy 57, 634–640.